Life goes on without much to write about. 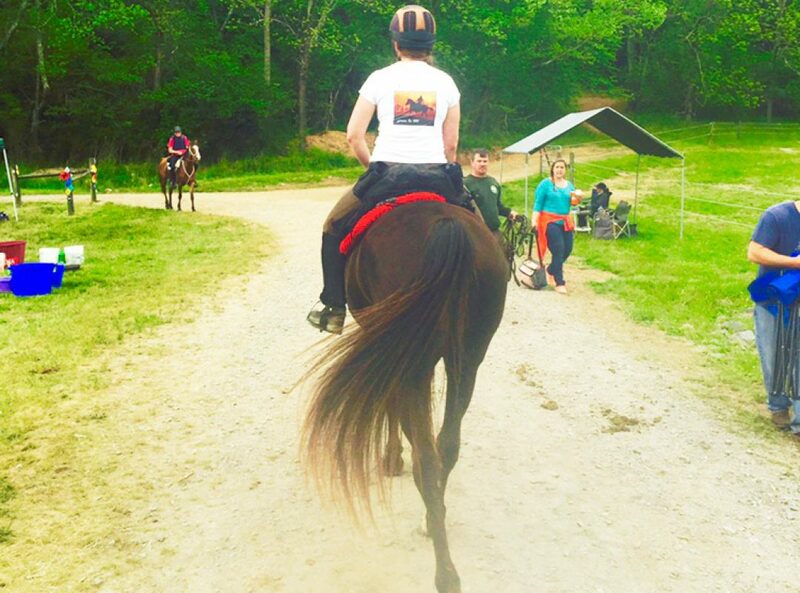 A great trail ride with girlfriends, days in the field… nothing particularly interesting. I decided to take a short ride in the afternoon and upon arriving at the pasture Khaleesi came over to greet me. I gave her a rub and she walked off across the field. Sometimes she’s easy to ‘catch’ and wiling to come out and do whatever I have planned. Sometimes she walks off and it takes some time. What is she saying today? What I sorted out with some trial and error was she would allow me to approach her and rub her and scratch her but if I went to halter she would leave. I always allow her to leave. I want her to come with me willingly so I continue to converse and connect in the field until she puts her head in the halter. Not a trap- her choice. This always happens eventually. The pattern that developed was interesting to me. She would walk off sometimes toward the electric fence and stand at it gazing intently. It seemed that she was saying she would like me to open up the fence to allow them to eat the gorgeous grass in the 2/3 of the field I currently have them cut off of (with the electric fence). It’s too much grass for them. Last year K began to get symptoms of low grade laminitis from too much spring grass. I want to keep her hooves in good shape and her system healthy so she’s on limited grass and I supplant with hay. She stares out over the electric fence and I say: I know girl, but I won’t do it- it’s not good for you. I approach her and she takes off. Sometimes at a walk sometimes a little buck and a trot. She circles wide around me then squares up and looks right at me. She isn’t getting as far away from me as possible. I’ve seen that in times past. She isn’t going far. And she’s engaged with me- focused on me. Squared up with me. Communicating something. She isn’t leaving completely but also doesn’t want me to approach and catch her. At one point as she was looking right at me she began to stomp her back leg up and down. What is it? I know your are trying to tell me something but I’m struggling hearing you. I approach and she either allows me to rub her or walks off again. One time she stomped her opposite back leg. All of this went on probably 15-20 minutes. She walked back to the fence. Stood right there staring. As I approach her I can hear it rhythmically making the zapping electric sound. I think that it is kind of odd… that I can hear the fence. I’m close to it, but it’s not usually that audible. Khaleesi is again standing at the fence. And near where she’s standing is one of the metal T posts — the sound is louder there. There is a spot where the electric tape has slipped slightly and is touching the metal post. It is zapping right there and I think the zapping is irritating to her (certainly she has a more sensitive neuro-electrical system), or with the extreme wet weather lately the current is going through the metal post and into the wet ground causing them irritation that way…. Whatever the issue- there was one or maybe multiple ones. I looked at her and acknowledged that something was wrong and walked over to unhook the fence electrode. I then adjusted the tape correctly and she never moved. I hooked the electrode back up and she continued to stay exactly in place. Now the fence wasn’t making any audible zapping sound. I returned and rubbed her neck; she was now very relaxed. Licking and chewing softly. I thanked her for showing me and for being patient while I tried to understand. After a few minutes of standing there calmly I put the halter up and she put her nose in and came with me. I decided not to ride. I’d spent an extra half hour trying to understand her and then fix the fence and then relax in the field. The connection we made together was more important than a ride. I cleaned up more of the glue residue from her hooves and then took her to a spot on the grass by the pond where she could graze some tender green stuff and enjoyed a sparkling water. A little time to hang out and relax for a few thinking of my friend Karin who talked often about her favorite times hand grazing her favorite Arabian. I walked her around the pavement (good for her legs and feet) then returned her to the field with fresh hay. It was a nice day but often I feel like I’m playing charades with someone who doesn’t speak my language. How on earth am I going to get better at understanding her? It was terribly time consuming for me to figure out something so simple as to fix the fenceline. When I looked back at the video I took when I was trying to understand and thought I might need to get another set of eyes to help me- the hindsight made it so painfully obvious! She was doing everything except become a Narnia talking horse to show me the fence was not right- you can even hear the clicking in the videos. I suppose time and patience. And to keep trying to improve my language skills each time we interact. And thankfully she seems to be patient with me too. This follow up video is from the next day- with halter and lead I came in to see how the process to bring her in would go. She walked across the entire field. Checked her dish (no food) then walked toward me and stopped. I approached the last feet and she put her nose in the halter.